View of the Hudson near the Garrison Train Station and Garrison Art Center. Photo by Julie Platner. Moseying south down Route 9D along the Hudson toward Cold Spring and Garrison in northern Putnam County, one could easily imagine that the mountains are a thoughtful, friendly sort. Due west across the river, wreathed in ridges, Storm King stands to its full 1,350 feet in salutation. 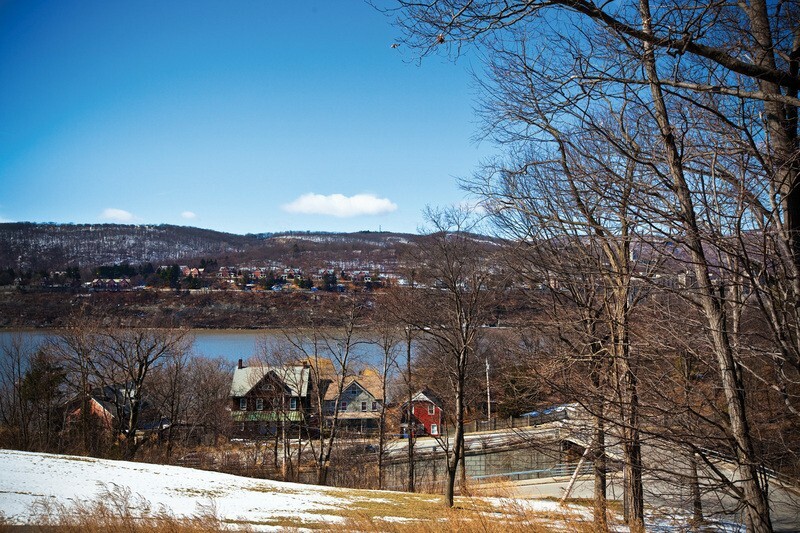 Above, 1,250-foot-tall Breakneck Ridge politely straddles an underpass to let you through. Toot the car (or bike) horn for a fun echo beneath that craggy range. Upon exiting, majestic Mount Taurus gives a mapled high-five. Pass the Chalet on the Hudson overlooking the river. All the while just east of the road, lofty yet flirty Hudson Highlands Park blows fresh breezes from the sky. Other fanciful greetings follow. The sun flees cloud cover to paint grey vistas gold. The river grows white cat’s-paws that all wave in your direction. A Montreal-bound Amtrak train whooshes by, as if on cue. No, you haven’t lost it. It’s just the beguiling, dramatic beauty of Philipstown, which comprises the Village of Cold Spring, the hamlet of Garrison, the Village of Nelsonville, and Continental Village. Fifty-one square miles in area, Philipstown boasts a population of about 9,500. Folks in Philipstown savor their Cold Spring Gazebo summer sunset concerts, where eclectic fare ranges from folk to jazz. The Putnam Historical Society and Foundry School Museum lecture series on local lore are usually well attended. And the Bard of Avon is alive and well at Boscobel on summer nights when the Hudson Valley Shakespeare Festival hoists its gargantuan, turreted tent. Enticements like Chapel of Our Lady Restoration concerts, not to mention Concentric Art’s Annual Outdoor Sculpture exhibit at bucolic Saunder’s Farm, are added treats. No wonder contented souls are ubiquitous, whether strolling Cold Spring’s Main Street, canoeing Constitution Marsh, or hitting the Appalachian Trail in Garrison. Cold Spring and Garrison are different in many ways. But identical vis-a-vis the complete absence of millennial suburban development. Cold Spring’s delightfully chain store-bereft Main Street leads the way to the Metro-North Station, and the Hudson River opposite the Storm King Mountain range. New York City folks are known to hop aboard Metro-North at Grand Central, and in a little more than an hour spend Sunday afternoons browsing such establishments as the Chickadee Gallery, Antique Alley, Country Goose, and Mikkonoma Studio and catching a bite at the Foundry Cafe, Cathryn’s, or a host of other good eateries while leafing through a copy of the 143-year old weekly Putnam County News & Recorder. Afterwards, you’ll find them gazing wistfully at the vintage dwellings that lend the town its homey character.